A friend delivered at just about 6 months, prematurely while on a business trip to the U.S. Post delivery, the medical authorities insisted that the husband be flown in asap. The baby was transferred to a specialty hospital, where she will remain till May 2016. The husband got in touch with my friend's company, a know IT organisation, where the responses ranged from rude to helpful. All this while, another friend of ours, who was also the one who got her immediate medical attention when she started showing signs of early delivery, was the only one beside her. Many of us, here in India, were constantly checking with our friends and relatives in the US, to see if anybody can help her with the legal formalities in her case. Meanwhile, another friend of ours sent a tweet to our External Affairs Minister Sushma Swaraj. And voila, an official from our consulate was sent to meet my friend within 24 hours. He called up the company and advised them on the course of action ahead. I'm speechless, and overwhelmed by the attention my friend got in the US almost immediately after the tweet we sent over from India. 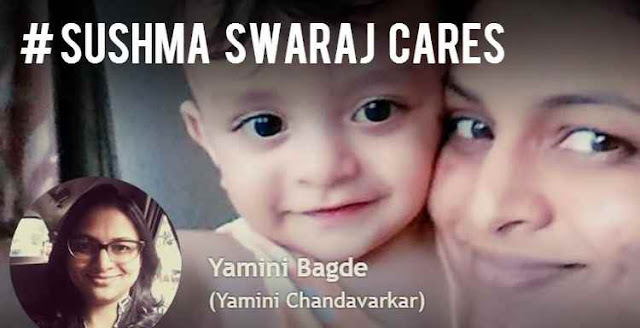 For a mother, who has already gone through the most difficult challenge, without any support to calm her nerves, being all alone in a country she was to leave 24 hours later - this prompt action by the Indian Consulate is more than a mere duty on their part. Mothers usually term such unprecedented kindness as 'God's Grace' and God's grace it was - relayed by Twitter and put to execution by the Consulate of India.